Alfresco Share is a great ECM web application, but there is one detail that annoys all users, and here is how to fix it. 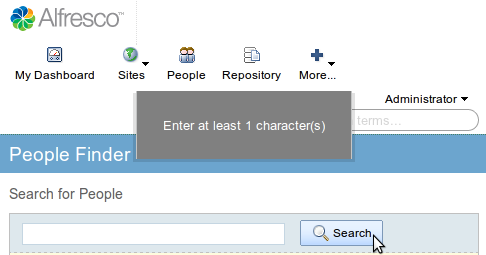 The problem: when clicking "Search" in a user/group selection dialog (for instance when creating a workflow), the following message appears: "Enter at least 1 character(s) to search". Which means that if you don't remember the name of the group, you have to try all letters: a,b,c,... hoping to find it. This is an incredible waste of time, and impossible to do in Japanese. A trick is to enter an asterisk * (or "name:*" in some cases), but it does not work on all dialogs, and it is not user-friendly. At the end of this file, just before "</alfresco-config>", add this XML. And now the problem should be fixed! Same message in other languages: Saisir au moins 1 caractère(s), 1文字以上入力してください, Geben Sie mindestens 1 Buchstaben ein, Immettere almeno 1 caratteri, Introduzca al menos 1 caracter(es). Great hint! This modification works even with Alfresco 4.2.4. Thanks.